One of the areas we specialize in is customer SugarCRM development. We work with our clients to map their various workflows to functions within SugarCRM and help streamline the process. In many cases, we extend SugarCRM functionality to help reduce the amount of time it takes to conduct their day to day CRM business. Create multi-document custom proforma quotes, estimates and proposals. 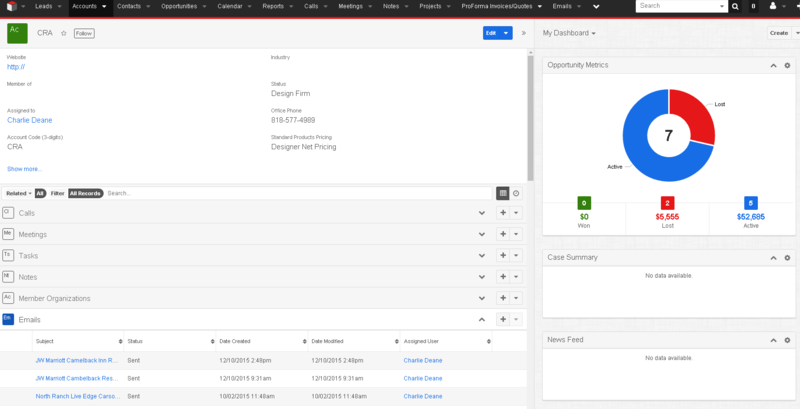 Build case tracking into every customer touch point – from pre-sales through on-boarding to post-installation or sale. Created custom search and filters for modules to consolidate information and filter out superfluous and irrelevant information for a particular process. Integrated lead scoring based upon company lookup via API integration with Hoovers or state-specific Corporations searches. SugarCRM destination-based tax lookup using cloud-based systems such as Strike Iron or Avalara.